Mariners, Seahawks, Sonics, Canucks, and any other sports tidbits we deem to be worthy. Or other stuff. All this from the minds of two former residents of the humble town of Bremerton, Washington. Cast: David (Bremerton WA), Jeremy (2003-2007). All Felix. All the time. 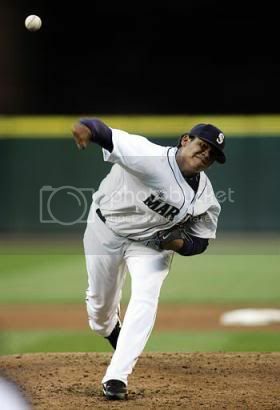 When I think about Felix, I almost forget that the Mariners are in the cellar. Almost. This IS the game thread, folks. Enjoy yourself. Yes, replace (at) with @, but you knew that. Who Wants to Watch the World Series?